The weather in Vienna is so unpredictable! I wasn’t lucky both the times and my clothing choices turned out to be poor because I didn’t pack enough layers. Option 1: Seeing the whole of Belvedere Palace and Austrian National Library. Spending about EUR 30 for the visits. Option 2: Seeing the Belvedere gardens (free entry) and the Austrian National Library. Skipping the Belvedere Palace completely. Spending less than EUR 10 for both. Needless to say, I chose Option 2. An easy 15 minute tram ride from the centre of Vienna, the Belvedere Gardens have more locals than tourists! At least on a Sunday morning. The locals were exercising and running amongst all that glory, just very casual! One of the locals clicked a photo for me and we got to talking. It turned out how she and her husband had lived in the South of India about 16 years ago! She even knew a little Tamil and Hindi and we ended up speaking a lot about India. I was impressed by her friendly demeanour, something a little unusual in Vienna. I wouldn’t have ever thought that I would be speaking Hindi in the Belvedere Gardens in Vienna! I think she stole a bit of thunder of those French styled gardens. But all in all it was a great visit. The Austrian National Library costs EUR 7 (as of 2016) to visit. When I visited, there was an exhibition celebrating the life of Emperor Franz Joseph (1830-1916) who ruled for over the country half a century. Emperor Joseph was known to be very creative and imaginative so the whole library was such. There were his collection of letters, drawings, photographs and paintings all around me and it was wonderful how well they were preserved. The Library had a unique collection of ancient books that were not to be touched. If I had a better camera, I could have got more shots but standing there was better from what I remember. I secretly wished to have a look at all those books! The library would have been more fun had a section been opened to the public. Hence my visit was short but I learnt a lot about the history of Austria. Vienna as a city has a lot to offer because of its fantastic transport system, old world cafes and cultural life. However, the locals were not as friendly. Despite visiting twice and for longer intervals, I have no friends from the city. I think people need to be more open and kinder especially towards Asians. Have you traveled to Vienna?? What was your experience?? Thanks Francis. checking it out now. So Vienna and Trieste- we get two places in common for our European love! we have such similar tastes in travel. Yea standoff is the right word. Love libraries – you should see the one in Coimbra, Portugal some time. Also love Vienna – have been several times. After you hit the famous museums, try the Museum of Globes, the Furniture Depository and the Hundertwasser. 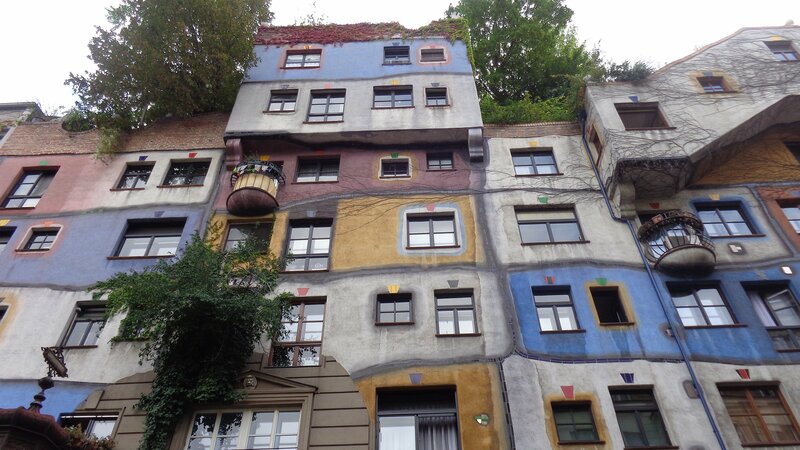 The pic of Hundertwasser is added!! You may have missed. Yes, I noticed the Hundertwasser House immediately. It was one of the reasons why I loved Vienna so much. I had his Uneven Floor text on the first page of my favourite photo album. As a curiosity, his original surname is Stowasser, but when he learned that “sto” means “hundred” in several Slavic languages (including Slovenian), he changed his name (to mean “hundred waters”). Oh no, I haven’t, I was there in the pre-digital era, and have only been blogging for the last three years and a bit. Thanks for your perspective. I certainly think they do. Agree about the English bit. I have never been but often wondered about it, now thanks to your post it is added to my love to visit list. I love old libraries like this. The one in Melk Abby is amazing. Austrians are very nice people, just quite reserved, not warm and open like Italians. I only had a day in Vienna but loved it. My experience in school there was filled with xenophobic, anti-Semitic and bigoted experiences. But then, even most Germans hate that corner of Germany. What I also experienced everywhere was that people would start speaking “pidgin German” to either of my parents, who are not native speakers. I’ve had History teachers who blatantly denied the Holocaust in class. And I’ve had Germans physically move their baby carriages, children, and themselves away from us when I was with my Turkish friends. Outwardly it’s very “we are open, sorry for what we did in WWII.” Reality is different. Of course, not everyone is like that. I have less than a handful of German friends who know how I feel. But these negative experiences outweigh the positive ones. Though, now when I think about it, these positive experiences all have to do with foreigners I met in Germany. Plus, when people attack your family and friends, you’re less likely to forgive. Oh, and that sense of superiority. Which is interesting, because I get that with other nations, too. But with Germany I’m less forgiving. I know Germany is hugely popular, and you’re not supposed to say anything bad against it. And, of course, this is my opinion, based on my own experience. But I always felt that if the Germans I knew could badmouth America without having been there, just because it was cool, I’m more than justified giving my opinions based on my own experience. Funny thing is, in Finland they follow the law to the letter, too. But there you get the impression it’s for human safety. In Germany I always get the impression that it’s for the sake of the law. I always call them the robots of Europe. I have good friends who hate France with a passion, or America. And it doesn’t bother us. We can still be close. But I know their reasons, I may not accept them, but I know they come from their own experiences, and are valid. “That corner of Germany”? Austria isn’t Germany.